The kingdom of heaven likened unto a certain king, which would take account of his servants. And when he had begun to reckon, one was brought unto him, which owed him ten thousand talents. But foreasmuch as he had not to pay, his lord commanded him to be sold, and his wife, and children, and all that he had, and payment to be made. The servant therefore fell down, and worshipped him, saying, Lord, have patience with me, and I will pay thee all. The the lord of that servant was moved with compassion, and loosed him, and forgave him the debt. But the same servant went out, and found one of his fellowservants, which owed him an hundred pence: and laid hands on him, and took him by the throat, saying, Pay me that thou owest. And his fellowservant fell down at his feet, and besought him, saying, Have patience with me, and I will pay thee all. And he would not: but went and cast him into prison, till he should pay the debt. So when his fellowservants saw what was done, they were very sorry, and same and told unto their lord all that was done. Shouldest not thou also have had compassion on they fellowservant, even as I had pity on thee? So, likewise shall my heavenly Father do also unto you, if ye from your hearts forgive not every one of his brother their trepasses. Reading the Gospel of Sri Ramakrishna would definitely enrich one's spiritual life. Here it will be posted regularly. A short video on Sri Ramakrishna is also embedded to know him better through the words of his foremost disciple Swami Vivekananda. IT WAS ON A SUNDAY in spring, a few days after Sri Ramakrishna's birthday, that M.[Mahendranath Gupta, the author of Gospel] met him the first time. 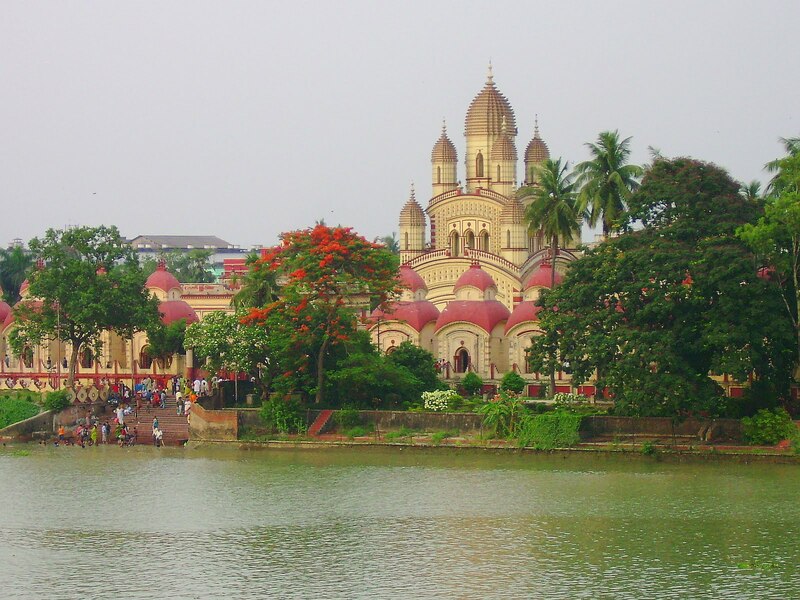 Sri Ramakrishna lived at the Kalibari, the temple garden of Mother Kali, on the bank or the Ganges at Dakshineswar. M., being at leisure on Sundays, had gone with his friend Sidhu to visit several gardens at Baranagore. As they were walking in Prasanna Bannerji's garden, Sidhu said: "There is a charming place on the bank of the Ganges where a paramahamsa lives. Should you like to go there?" 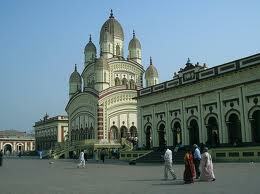 M. assented and they started immediately for the Dakshineswar temple garden. They arrived at the main gate at dusk and went straight to Sri Ramakrishna's room. And there they found him seated on a wooden couch, facing the east. With a smile on his face he was talking of God. The room was full of people, all seated on the floor, drinking in his words in deep silence. M. stood there speechless and looked on. It was as if he were standing where all the holy places met and as if Sukadeva himself were speaking the word of God, or as it Sri Chaitanya were singing the name and glories of the Lord in Puri with Ramananda, Swarup, and the other devotees. Sri Ramakrishna said: "When, hearing the name of Hari or Rama once, you shed tears and your hair stands on end, then you may know for certain that you do not have to perform such devotions as the sandhya any more. Then only will you have a right to renounce rituals; or rather, rituals will drop away of themselves. Then it will be enough it you repeat only the name of Rama or Hari, or even simply Om." Continuing, he said, "The sandhya merges in the Gayatri, and the Gayatri merges in Om." M. looked around him with wonder and said to himself: "What a beautiful place! What a charming man! How beautiful his words are! I have no wish to move from this spot," After a few minutes he thought, "Let me see the place first; then I'll come back here and sit down." As he left the room with Sidhu, he heard the sweet music of the evening service arising in the temple from gong, bell, drum, and cymbal. He could hear music from the nahabat, too, at the south end of the garden. The sounds travelled over the Ganges, floating away and losing themselves in the distance. A soft spring wind was blowing, laden with the fragrance of flowers; the moon had just appeared. It was as if nature and man together were preparing for the evening worship. M. and Sidhu visited the twelve Siva temples, the Radhakanta temple, and the temple of Bhavatarini. And as M. watched the services before the images his heart was filled with joy. On the way back to Sri Ramakrishna's room the two friends talked. Sidhu told M. that the temple garden had been founded by Rani Rasmani. He said that God was worshipped there daily as Kali, Krishna, and Siva, and that within the gates many sadhus and beggars were fed. When they reached Sri Ramakrishna's door again, they found it shut, and Brinde, the maid, standing outside. M., who had been trained in English manners and would not enter a room without permission, asked her, "Is the holy man in?" Brinde replied, "Yes, he's in the room." M: "How long has he lived here?" BRINDE: "Oh, he has been here a long time." M: "Does he read many books?" BRINDE: "Books? Oh, dear no! They're all on his tongue." M. had just finished his studies in college. 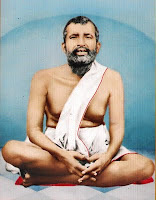 It amazed him to hear that Sri Ramakrishna read no books. M: "Perhaps it is time for his evening worship. May we go into the room? 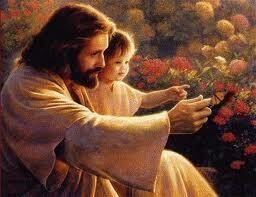 Will you tell him we are anxious to see him?" BRINDE: "Go right in, children. Go in and sit down." Entering the room, they found Sri Ramakrishna alone, seated on the wooden couch. Incense had just been burnt and all the doors were shut. As he entered, M. with folded hands saluted the Master. Then, at the Master's bidding, he and Sidhu sat on the floor. Sri Ramakrishna asked them: "Where do you live? What is your occupation? 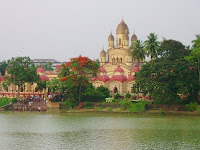 Why have you come to Baranagore?" M. answered the questions, but he noticed that now and then the Master seemed to become absent-minded. Later he learnt that this mood is called bhava, ecstasy. It is like the state of the angler who has been sitting with his rod: the fish comes and swallows the bait, and the float begins to tremble; the angler is on the alert; he grips the rod and watches the float steadily and eagerly; he will not speak to anyone. Such was the state of Sri Ramakrishna's mind. Later M. heard, and himself noticed, that Sri Ramakrishna would often go into this mood after dusk, sometimes becoming totally unconscious of the outer world. M: "Perhaps you want to perform your evening worship. In that case may we take our leave?" SRI RAMAKRISHNA (still in ecstasy): "No — evening worship? No, it is not exactly that." After a little conversation M. saluted the Master and took his leave. "Come again", Sri Ramakrishna said. T it possible for a man to be great without being a scholar? How wonderful it is! I should like to see him again. He himself said, 'Come again.' I shall go tomorrow or the day after. Hiranyakashipu was the king of the Daityas. The Daityas, though born of the same parentage as the Devas or gods, were always, at war with the latter. The Daityas had no part in the oblations and offerings of mankind, or in the government of the world and its guidance. But sometimes they waxed strong and drove all the Devas from the heaven, and seized the throne of the gods and ruled for a time. Then the Devas prayed to Vishnu, the Omnipresent Lord of the universe, and He helped them out of their difficulty. The Daityas were driven out, and once more the gods reigned. Hiranyakashipu, king of the Daityas, in his turn, succeeded in conquering his cousins, the Devas, and seated himself on the throne of the heavens and ruled the three worlds -- the middle world, inhabited by men and animals; the heavens, inhabited by gods and godlike beings; and the nether world, inhabited by the Daityas. Now, Hiranyakashipu declared himself to be the God of the whole universe and proclaimed that there was no other God but himself, and strictly enjoined that the Omnipotent Vishnu should have no worship offered to Him anywhere; and that all the worship should henceforth be given to himself only. 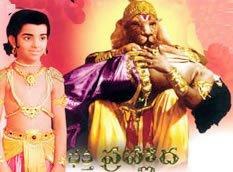 Hiranyakashipu had a son called Prahlada. Now, it so happened, that this Prahlada from his infancy was devoted to God. He showed inclinations of this as a child; and the king of the Daityas, fearing that the evil he wanted to drive away from the world would crop up in his own family, made over his son to two teachers called Shanda and Amarka, who were very stern disciplinarians, with strict injunctions that Prahlada was never to hear even the name of Vishnu mentioned. The teachers took the prince to their home, and there he was put to study with the other children of his age. But the little Prahlada, instead of learning from his books, devoted all the time in teaching the other boys how to worship Vishnu. When the teachers found it out, they were frightened, for the fear of the mighty king Hiranyakashipu was upon them, and they tried their best to dissuade the child from such teachings. But Prahlada could no more stop his teaching and worshipping Vishnu than he could stop breathing. To clear themselves, the teachers told the terrible fact to the king, that his son was not only worshipping Vishnu himself, but also spoiling all the other children by teaching them to worship Vishnu. The monarch became very much enraged when he heard this and called the boy to his presence. He tried by gentle persuasions to dissuade Prahlada from the worship of Vishnu and taught him that he, the king, was the only God to worship. But it was to no purpose. The child declared, again and again, that the Omnipresent Vishnu, Lord of the universe, was the only Being to be worshipped -- for even he, the king, held his throne only so long as it pleased Vishnu. The rage of the king knew no bounds, and he ordered the boy to be immediately killed. So the Daityas struck him with pointed weapons; but Prahlad's mind was so intent upon Vishnu that he felt no pain from them. When his father, the king, saw that it was so, he became frightened but, roused to the worst passions of a Daitya, contrived various diabolical means to kill the boy. He ordered him to be trampled under foot by an elephant. The enraged elephant could not crush the body any more than he could have crushed a block of iron. So this measure also was to no purpose. Then the king ordered the boy to be thrown over a precipice, and this order too was duly carried out; but, as Vishnu resided in the heart of Prahlada, he came down upon the earth as gently as a flower drops upon the grass. Poison, fire, starvation, throwing into a well, enchantments, and other measures were then tried on the child one after another, but to no purpose. Nothing could hurt him in whose heart dwelt Vishnu. At last, the king ordered the boy to be tied with mighty serpents called up from the nether worlds, and then cast to the bottom of the ocean, where huge mountains were to be piled high upon him, so that in course of time, if not immediately, he might die; and he ordered him to be left in this plight. Even though treated in this manner, the boy continued to pray to his beloved Vishnu: "Salutation to Thee, Lord of the universe. Thou beautiful Vishnu!" Thus thinking and meditating on Vishnu, he began to feel that Vishnu was near him, nay, that He was in his own soul, until he began to feel that he was Vishnu and that he was everything and everywhere. As soon as he realised this, all the snake bonds snapped asunder; the mountains were pulverised, the ocean upheaved, and he was gently lifted up above the waves, and safely carried to the shore. As Prahlada stood there, he forgot that he was a Daitya and had a mortal body: he felt he was the universe and all the powers of the universe emanated from him; there was nothing in nature that could injure him; he himself was the ruler of nature. Time passed thus, in one unbroken ecstasy of bliss, until gradually Prahlada began to remember that he had a body and that he was Prahlada. As soon as he became once more conscious of the body, he saw that God was within and without; and everything appeared to him as Vishnu. When the King Hiranyakashipu found to his horror that all mortal means of getting rid of the boy who was perfectly devoted to his enemy, the God Vishnu, were powerless, he was at a loss to know what to do. The king had the boy again brought before him, and tried to persuade him once more to listen to his advice, through gentle means. But Prahlada made the same reply. Thinking, however, that these childish whims of the boy would be rectified with age and further training, he put him again under the charge of the teachers, Shanda and Amarka, asking them to teach him the duties of the king. But those teachings did not appeal to Prahlada, and he spent his time in instructing his schoolmates in the path of devotion to the Lord Vishnu. When his father came to hear about it, he again became furious with rage, and calling the boy to him, threatened to kill him, and abused Vishnu in the worst language. But Prahlada still insisted that Vishnu was the Lord of the universe, the Beginningless, the Endless, the Omnipotent and the Omnipresent, and as such, he alone was to be worshipped. The king roared with anger and said: "Thou evil one, if thy Vishnu is God omnipresent, why doth he not reside in that pillar yonder?" Prahlada humbly submitted that He did do so. "If so," cried the king, "let him defend thee; I will kill thee with this sword." Thus saying the king rushed at him with sword in hand, and dealt a terrible blow at the pillar. Instantly a thundering voice was heard, and lo and behold, there issued forth from the pillar Vishnu in His awful Nrisimha form -- half - lion, half - man! Panic - stricken, the Daityas ran away in all directions; but Hiranyakashipu fought with him long and desperately, till he was finally overpowered and killed. Then the gods descended from heaven and offered hymns to Vishnu, and Prahlada also fell at His feet and broke forth into exquisite hymns of praise and devotion. And he heard the Voice of God saying, "Ask, Prahlada, ask for anything thou desirest; thou art My favourite child; therefore ask for anything thou mayest wish." And Prahlada choked with feelings replied, "Lord, I have seen Thee. What else can I want? Do thou not tempt me with earthly or heavenly boons." Again the Voice said: "Yet ask something, my son." And then Prahlada replied, "That intense love, O Lord, which the ignorant bear to worldly things, may I have the same love for Thee; may I have the same intensity of love for Thee, but only for love's sake!" Then the Lord said, "Prahlada, though My intense devotees never desire for anything, here or hereafter, yet by My command, do thou enjoy the blessings of this world to the end of the present cycle, and perform works of religious merit, with thy heart fixed on Me. And thus in time, after the dissolution of thy body, thou shalt attain Me." Thus blessing Prahlada, the Lord Vishnu disappeared. 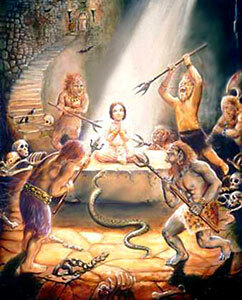 Then the gods headed by Brahma installed Prahlada on the throne of the Daityas and returned to their respective spheres.